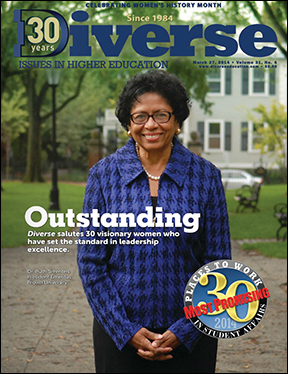 Honoring “Women’s History Month,” Diverse magazine published its third annual report highlighting the work and contributions of 30 women to higher education. One of these honorees is Dr. Ana Gil-García, Professor of Educational Leadership at Northeastern Illinois University, and a past-president of the Chicago Chapter of the Fulbright Association. “This is an acknowledgement to the work and effort that women put to higher education,” Gil-García said. An award-winning educator and director of membership of the Chicago Fulbright Association, Gil-García has a long teaching career. She is a three-time Fulbright US Scholar (Venezuela, Middle East, and Armenia) who works tirelessly for a variety of community organizations. A native Venezuelan, Gil-García is an author, community leader, and advocate for Latino educational leaders. She holds a Doctorate degree in Educational Leadership, Master’s degree in Curriculum and Instruction, Specialist Degree in Middle School Curriculum, and Bachelor’s degree in Biology Teaching. By Mary Mares-Awe—FULBRIGHT RESEARCH SCHOLAR Valeriy Sergeevich Khan will be the key presenter at the 19th Annual Asian & Asian-American Heritage Conference at Northeastern Illinois University on April 3rd, 2014. Dr. Khan is a Fulbright Research Scholar at the Center of Russian, Eastern European and Eurasian Studies at the University of Kansas. 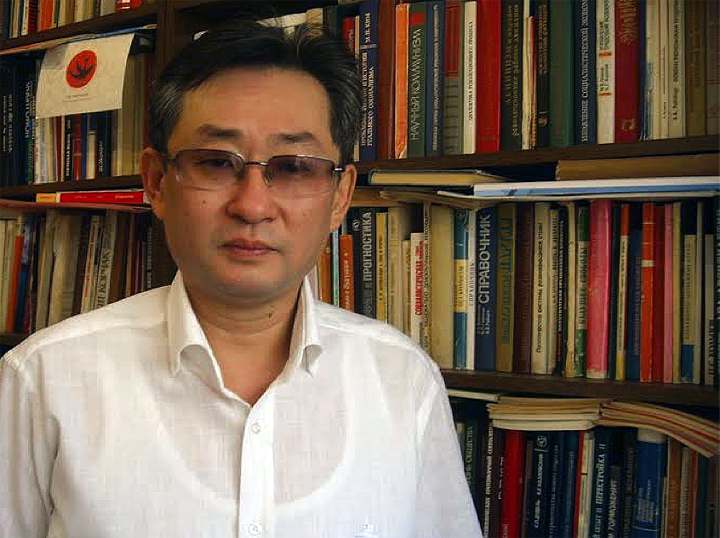 He is a well-known authority in the area of cultural and ethnic studies of the Korean diaspora and an expert on ethnic transformation of Korean emigrants. He has been a research fellow at the National Academy of Sciences of Uzbekistan serving as the Vice-Director of the Department of Ethnic Studies. Dr. Khan’s presentation entitled, Korean Central Asians—after the U.S.S.R, will take place on Thursday, April 3rd, at 10:50 am at the Golden Eagles room of the Student Union on the campus of Northeastern Illinois University. The event is co-sponsored by Fulbright, NEIU College of Arts & Sciences, and Asian/Global Resource Center. We encourage all our members and those interested in the topic of cultural identities among immigrant communities to attend this unique and interesting lecture. Panelists discuss the dangers journalists face while reporting on the drug cartels in Mexico: Documentarian Alex Ormaza, Columbia College Chicago Associate Professor Teresa Puente, “Sin Censura” radio host Vicente Serrano and Northeastern Illinois University Assistant Professor Brandon Bisbey. 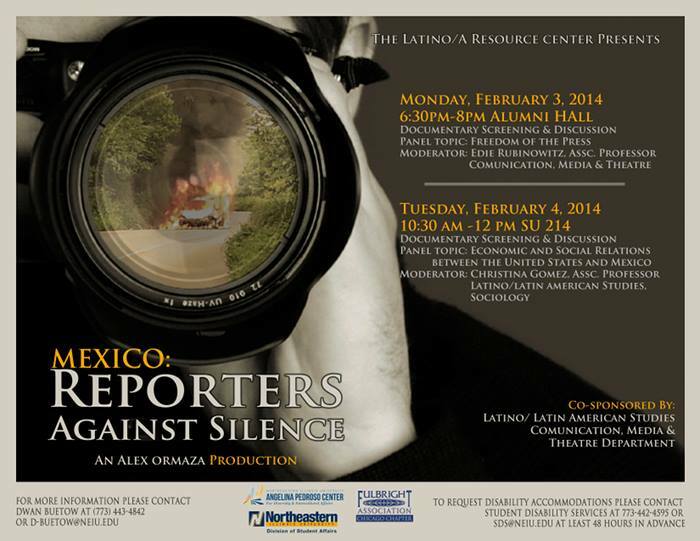 By Mary Mares-Awe—EARLIER THIS WEEK the Chicago Chapter of the Fulbright Association partnered with Northeastern Illinois University’s Latino Resource Center for the screening of the documentary “Mexico: Reporters Against Silence.” The film is produced by a fellow Fulbrighter, journalist Alex Ormaza. The documentary portrays the dangers journalists in Mexico face while reporting on the drug cartels and the drug war in that country. Ormaza produced this work while in Mexico in 2012-13 on a Fulbright grant. NEIU organized two panel discussions to complement the documentary screenings. 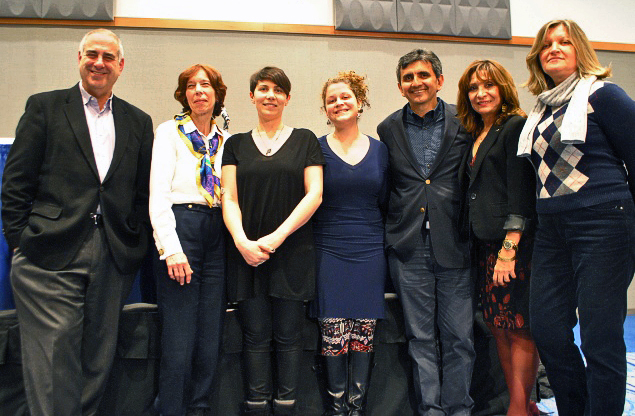 On Monday, February 3rd the panel discussion focused on press freedoms in Mexico. The second panel discussion took place on Tuesday, February 4th and focused on Economic and Social Relations between the U.S. and Mexico. Both sessions were attended by members of the Chicago Fulbright Association. “REPORTERS AGAINST SILENCE” is a documentary produced by journalist and Fulbrighter Alex Ormaza, who shot it while on a Fulbright grant in Mexico. The Chicago Chapter of the Fulbright Association invites you to two special screenings of this film. A different panel discussion will follow each individual screening. Each event is FREE. WHEN Monday February 3, 2014, 6:30-8 p.m. WHEN Tuesday February 4, 2014, 10:30 am-12:30 p.m. These events are co-sponsored by the Latino/Latin American Studies, Communication, Media and Theatre Departments, Northeastern Illinois University. By April Valentine—THE RESEARCH AND GRADUATE Studies Office and the International Programs Office of Purdue University Calumet in Hammond, Indiana, co-sponsored a coffee hour on Tuesday, November 26, 2013, for faculty and staff to learn about how participation in Fulbright programs enhances research and teaching from current and alumni Fulbright faculty. Fifteen people attended this event held during the lunch hour on the campus of Purdue University Calumet. Professor Colette Morrow, Department of English and Philosophy, is a Senior Fulbright Scholar. 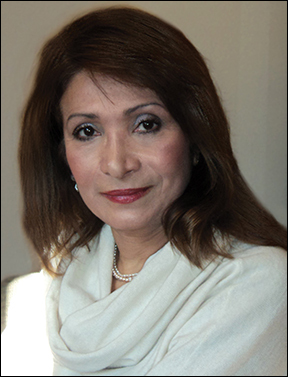 She participated in the Core Fulbright Grant program from 2000 to 2001 in Belarus, was presented the Fulbright Alumni Initiatives Award from 2003 to 2005 and has received three Fulbright Senior Specialist Grants (India, 2004; Bangladesh, 2006; Pakistan, 2010). Professor Morrow co-presented the topic Building Women’s and Gender Studies Locally and Globally through the Fulbright Scholar Award Program with Fulbright Scholar-in-Residence, Professor Rukhsana Hasan. Professor Hasan of the Department of Marketing, Human Resources, and Management is teaching, conducting research, supporting curriculum development, and giving presentations at the Ivy Tech Community College campus in East Chicago, Indiana, and at Purdue University Calumet for the 2013-2014 academic year. Hasan also presented on Dec. 3, 2013 at Northeastern Illinois University in Chicago. She is a faculty member at Fatima Jinnah Women University in Rawalpindi, Pakistan. Professor Kathryn Rowberg of the Department of Chemistry and Physics served as a Fulbright Fellow in Addis Ababa, Ethiopia, from 1992 to 1994 and in Reykjavik, Iceland, in 2004. She discussed the Fulbright application process, the challenges of serving effectively for short periods of time in another country and the lasting effects on her career and world view. Her presentation topic was A Tale of Two Cities: A Fulbright Fellow in Addis Ababa and Reykjavik. Professor and Department Head of Mechanical Engineering, George Nnanna received a Fulbright Specialist Award in 2011 to conduct research on water pollution and treatment at the University of Lagos in Nigeria. David Saide of the Education Sector at the Consulate-General of Brazil in Chicago was also in attendance and discussed opportunities for faculty to conduct research in Brazil. 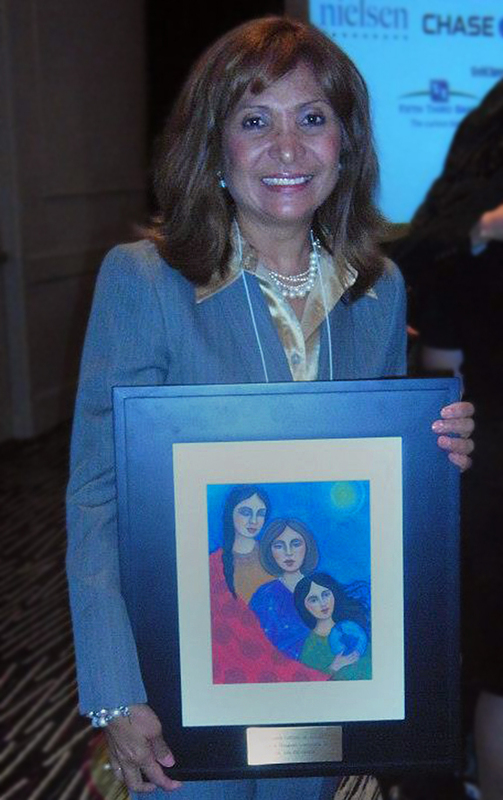 ON OCTOBER 2, 2013, our Fulbright Chicago chapter board member and Director of Membership Dr. Ana Gil-García, was presented with the 2013 María Mangual Award for her continued work to empower, educate and mentor Latinas. Mujeres Latinas en Acción offers this award every year. This organization, a non-for-profit born in 1970, is considered the longest-standing Latina organization in the United States, serving to empower Latinas through services that reflect their values and culture. The ceremony took place at the Double Tree by Hilton Hotel in the Magnificent Mile. 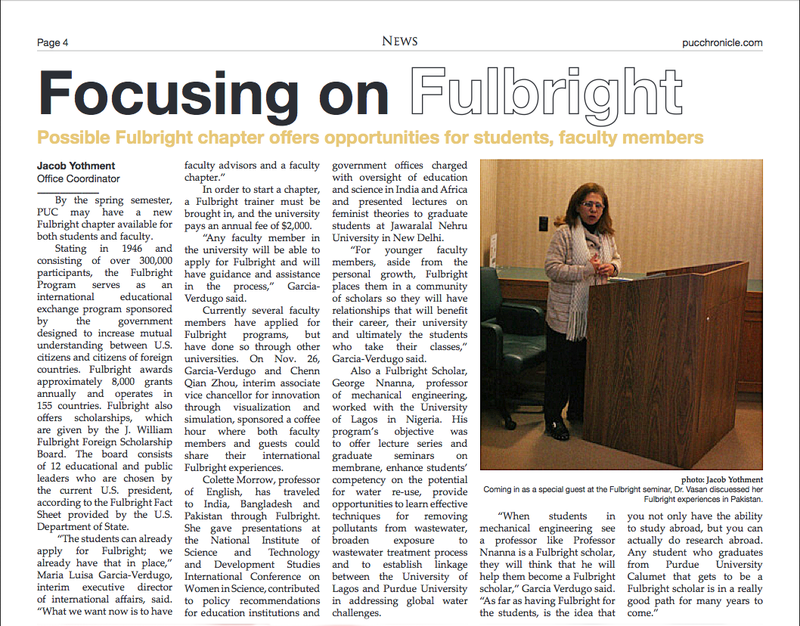 Dr. Ana Gil-García is a Fulbright Chicago chapter past president (2006-2008,) a three-time Fulbright scholar (Venezuela, Middle East and Armenia) and a professor of Educational Leadership at Northeastern Illinois University. She was named as one of the 2010 “Top Ten Chicago Latinos” and one of the “100 Most Influential Hispanics in the USA” by Hispanic Business magazine. She founded The Book Partnership, an ongoing international community service project of the Chicago Fulbright Association to bring literacy to Panama, Guatemala, Costa Rica, Egypt, Moldova, Ghana, Botswana and Ecuador in order to serve socioeconomically deprived schools in those regions.